New Mum Online: #SpecialK30 BritMums Special K How I’ve Changed Linky Challenge! #SpecialK30 BritMums Special K How I’ve Changed Linky Challenge! For the first time since 1983, Special K has updated its recipe. If you would like to try it, ensure you get the one with the above header on the box: "NEW delicious 3 grain recipe". We were sent a box a few weeks back, and it was so delicious and yummy that every day I had a bowl, Aaron wanted one too, so much so, that on 1st May we had to go and buy another box. It was left here whilst we had our 8 days in Ireland but I am very happy to be back to munching a bowl a day on our return. For some reason I have only had today's now. Yummy. It is quite honestly my favourite cereal at the moment. It also keeps you full up for hours. Well back to the purpose of this linky THIS is what I looked like, back in 1983. 1983 - aged 10 - where oh where is my fringe???? Digging out this photo confused me somewhat, as I had thought I had worn a fringe (bangs if you are American) all through my childhood, but no, here I am, fringeless! 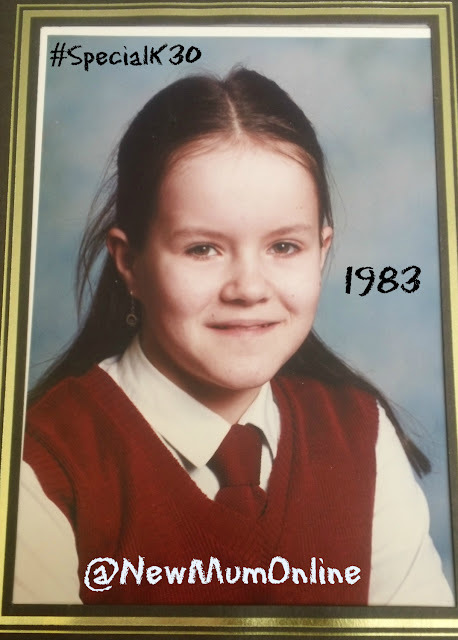 So I carried on searching and found a photo from my FIRST day at secondary school 1984 where I am still fringeless so the above is my last year at Junior School (4th year as they called it THEN), and is 1983. The fringes I wore all through childhood to protect my big spam! Who stole my fringe? 1984 first day at Secondary School - aged 11. I can't remember much about 1983 to be honest. I can't believe I am old enough to say it was 30 years ago. I suppose it was 30 years ago for everyone regardless of your age then or now ha ha! I am very pleased to say that my memory has not deserted me, and I can hum along to all of them. Anyway a requirement of this linky is that I tell you how I have changed, since 1983. Well... it is ironic that the fringe or lack of it, is a highlight of my 1983 photo, as I have not been wearing a fringe for the past 6 months, and can be seen most days wearing a pink headband to allow the light to fully illuminate my third eye ;-) as seen here, on our recent boat trip to Ireland. Aaron doesn't look happy as we are outside on the boat and he said it was too windy!!! However, as our recent trip to Ireland was for a wedding, I thought I ought to go for the well groomed look, so here I am back with fringe, on the day of the wedding with Aaron, after a mad last minute dash to the hairdressers on the eve of the wedding. #yikes! The above photos seem to have given me a pointy nose. Makes me look more and more like my dearly departed maternal Grandmother.... I need to lose that... I don't like it. Thankfully it does not appear in all photos, as can be seen below. This photo also shows that I am a tad heavier than I was in 1983. I really DO NOT want to do the maths there to be honest. Well it was a pleasure to go down memory lane so I am grateful for this linky and now need to put the cupboard back together after going through a dozen packets of photos. What do you think? Would you recognise the 1983 and the 2013 Liska as the same person? Have I changed a lot? 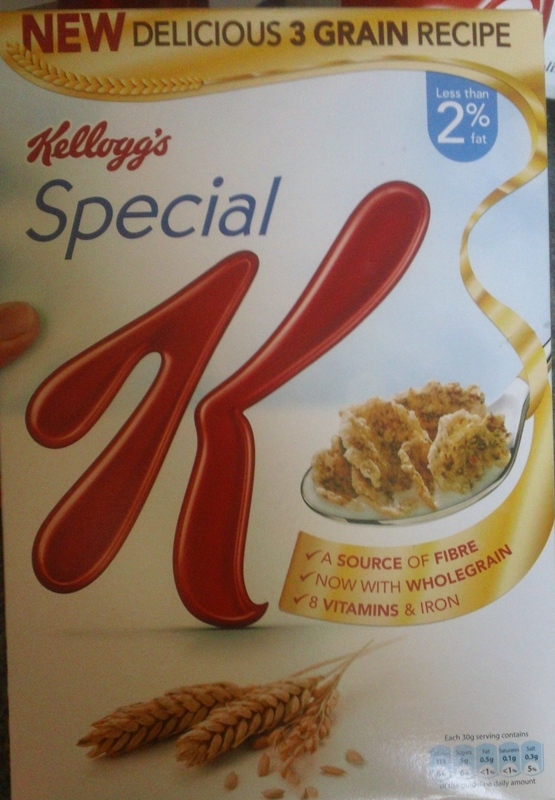 This post is an entry for the BritMums/Special K “How I’ve changed Linky challenge” and is to celebrate the change in recipe of Special K after 30 years. Thinking back to 1984/1985 I was BIG into my cross country running and used to get to school at 07:30 twice a week to run around Alexandra Palace with school friends including my mate Beatrice. The teacher was a letch so we used to run really fast every time he came near us. I was very brave going to school that early considering (a) it was DARK and (b) I left home before my Mum and Step Dad were even up yet. This linky has really made me go down memory lane. How about you? What were you up to in 1983? Great post & pics. I don't think you've changed much at all!